I grabbed this book as we headed out the door to drive an hour to my nephew's baptism. My husband, who was driving, kept asking questions. "Did you see the map?" "And the character chart?" "I like how she put scriptures at the start of every chapter." "I think that's one of my favorite scripture stories." "At what point does she start the story?" I looked at him. "Would you like to read it next?" I must add that my husband isn't really all that animated. Mr. Cool. Five minutes of intense reading later I hear, "Is it a good book?" 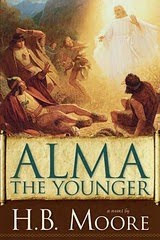 Moore brings the story of Alma the Younger to life in answer to the question, "How could the son of a revered high priest go so bad and lead so many astray?" Her take formed an intriguing answer. Before I read H.B. Moore's ALMA THE YOUNGER, I hoped she wouldn't glaze over things, that she would portray the fall of this would-be High Priest as significant enough to bring the intercession of an angel from God. From the first page I was drawn in, wanting to find out more, wanting to know these characters and where their paths led. It was especially compelling to have the opening scene show just how wicked the main character, Alma, the son of the High Priest, had become, and then the next chapter jump back only 3 months earlier. My mind reeled at how such a change could happen in such a short time, and I really wanted to know how the author approached that. I both loved Alma and cringed at him and kept turning pages, putting myself in Moore's Zarahemla, asking myself, "Where would I stand?" Moore keeps him real and doesn't sugar-coat his falling away, but shows the fine silken cords the adversary uses to draw those he would need to further his purposes. She succeeds in portraying Alma's sins without being gratuitous. Moore tempts the reader to believe Alma might be right, justified, because he believes it so fervently. Because he is, quintessentially, a hero. 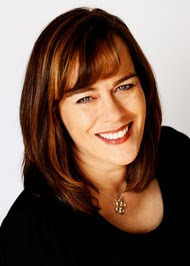 Cassia is sweet and sincere, and the sons of Mosiah charming and loyal, Ammon a leader in his own right. Moore's portrayal of the king and the government had me considering righteous dominion. As I read, I wasn't sure I could swallow the change I knew was to take place in Alma the Younger, but as a reader, I wanted it, and Moore made it believable. Yes, he would be changed. His redemption is all the more meaningful considering where his path of destruction was taking him and those who followed. Alma's redemption is not a fix-all, but that reflects real life. The struggles that come will now be accompanied with peace and strength from a higher power. I'll certainly never read the scripture story the same way again. And, the scripture references at the beginning of each chapter kept reminding me of God's hand in all things, even when they seemed bleak. If I have any disappointments with this book, it is that it ended too soon. I'm looking forward to reading the next book. Ammon, anyone? Here, hon, you can read it now. And yes, it was a very good book. Great review! And Heather is nothing but a sweetheart.